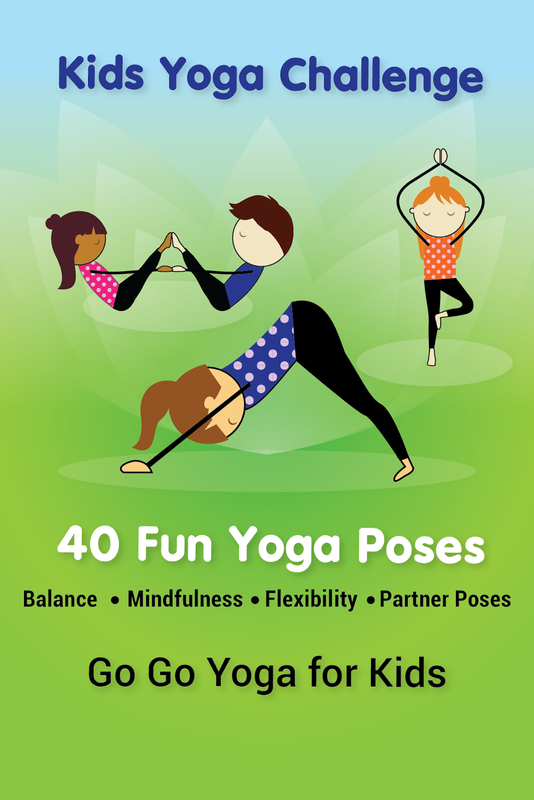 The following is a guest post by Sara Weis of Go Go Yoga for Kids, adapted from her books A Complete Guide to Yoga with Kids and Yoga Lessons for Children. We live in a fast-paced world and so do our children. How can we, as adults and teachers, help children connect with themselves and others and also learn to enjoy the moment they are in? What we think about ourselves can often impact how we develop. If we feel we are inadequate, then we'll behave like that. If we believe we are special and loved, we will most likely behave as if we are special and loved. 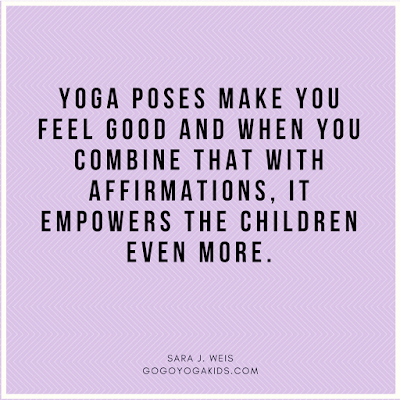 This is one reason why affirmations and mantras can be an important tool to help children develop positive foundations on which to grow. A positive self-belief system built in childhood will hopefully stay with a person throughout their life. The word 'mantra' comes from Sanskrit, and is generally used to mean a special word or phrase that's used in meditation. 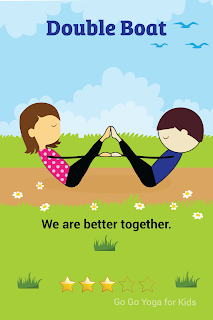 Some parents and teachers may be concerned that mantras conflict with their religious beliefs, but mantras don't need to have a religious aspect or overtone. You can think of mantras as a few positive words spoken to ourselves each day. This can make such a difference to our whole mind and heart. Mantras are similar to affirmations, and over time they can help change the way we feel. Mantras are repeated over and over to ourselves out loud or silently. It's a wonderful technique for kids to use to set themselves up for doing their best and feeling good about themselves and their efforts. Providing different tools for children to practice mindfulness with mantras, breathing exercises, and yoga poses is one of my passions. 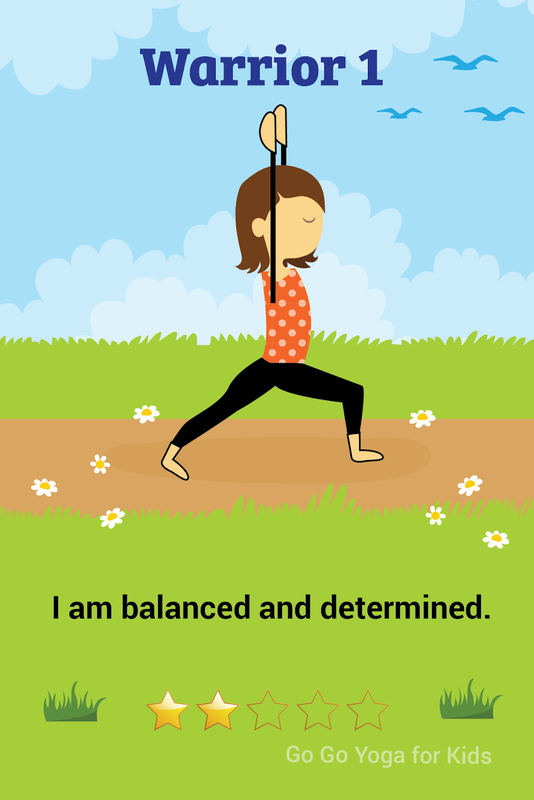 As I developed the Kids Yoga Challenge Pose Cards, I wanted to be sure to include all the important tools. 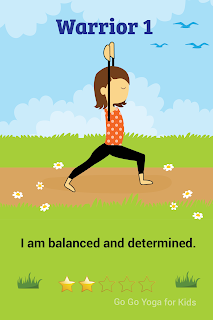 Each card shows a yoga pose and corresponding mantra. Each of the yoga poses involves a variety of muscles working and may make a person feel differently. The accompanying affirmation for each pose is short and memorable. 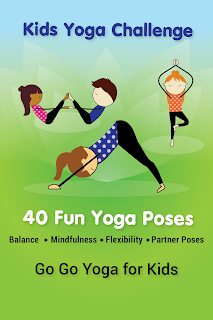 Try a few yoga poses with children. As they are holding each pose, ask them what muscles they feel working and also how does it make them feel. This practice involves mindfulness since it is not only what they feel working in their body, but how the pose makes them feel, i.e. strong, brave, or peaceful. For example, Warrior 1 Pose may make them feel strong, but Child’s Pose may make them feel safe. Then you can teach them a simple phrase, which they can remember in a stressful moment or a time of unease. Effective mantras for kids could be: "I am thankful," "I am loved," "I am safe," or "Let it go," which is also a great one for adults. It is no secret that many children learn best when they are moving. 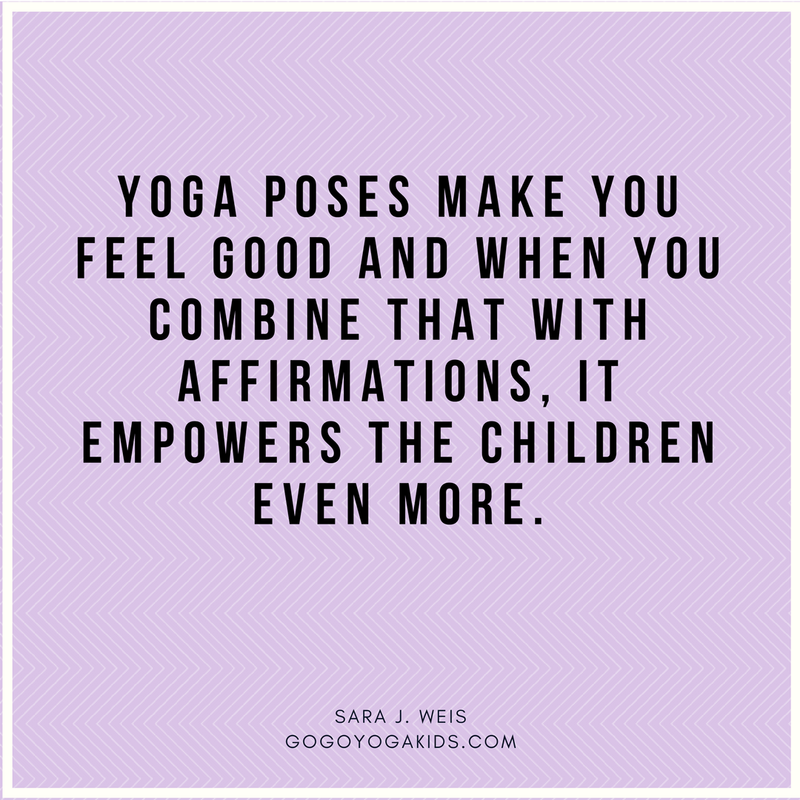 As a school teacher and children’s yoga instructor, I understand that when movement and affirmations are tied together, it can be a powerful way to help children learn. Most importantly, it helps them create inner confidence as children, which can help shape a person’s whole life. Sara J. Weis is a creative and passionate teacher who has inspired children for nearly twenty years. She holds a Master’s Degree in Education as well as Bachelor’s Degrees in both Early Childhood and Elementary Education. 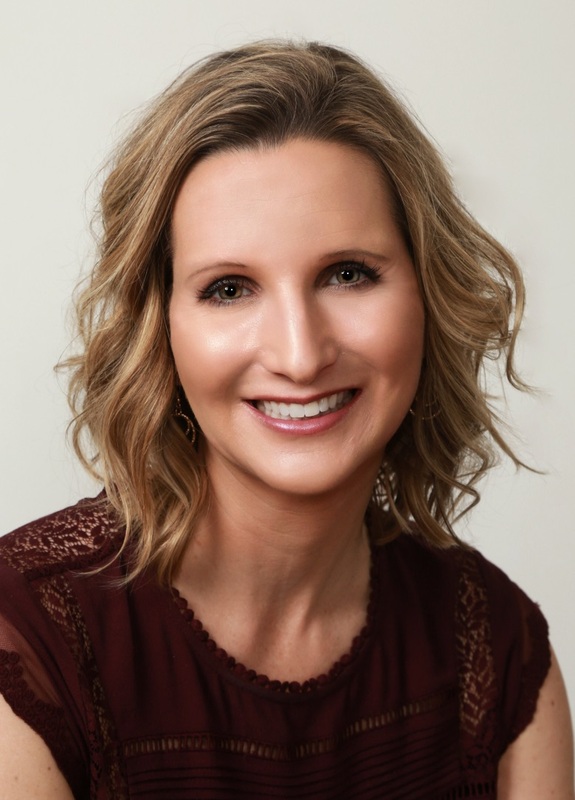 She currently teaches elementary creative writing classes for the West Des Moines School District and leads kids yoga classes for a nationally-known health and fitness club. She is the bestselling author of Go Go Yoga for Kids: A Complete Guide for Using Yoga with Kids, Yoga Lessons for Children and the creator of the Kids Yoga Challenge Pose Cards. Sara enjoys visiting schools and introducing kids to yoga through a variety of games, poses, music, movement and more. Find out more at GoGoYogaKids.com.